In recent years the subject of “chemtrails” has become less of a conspiracy theory as Geoengineering crept into the dialogue. Persistent jet contrails are commonly seen in clear blue skies, begging the question as to their purpose. It is now thought that these contrails could represent efforts by government to combat global warming. Through aerosolized spraying of certain substances in the stratosphere or troposphere, it is possible to reflect more sunlight back into space, thereby acting to cool the planet. This mimics large volcanic eruptions which have repeatedly cooled Earth’s climate for brief periods throughout its history. The eruption of Mount Pinatubo was the biggest such event in recent times. As far as geoengineering goes, reflecting more sunlight away from the planet would be far less costly than removing carbon dioxide from the atmosphere and would work much faster. 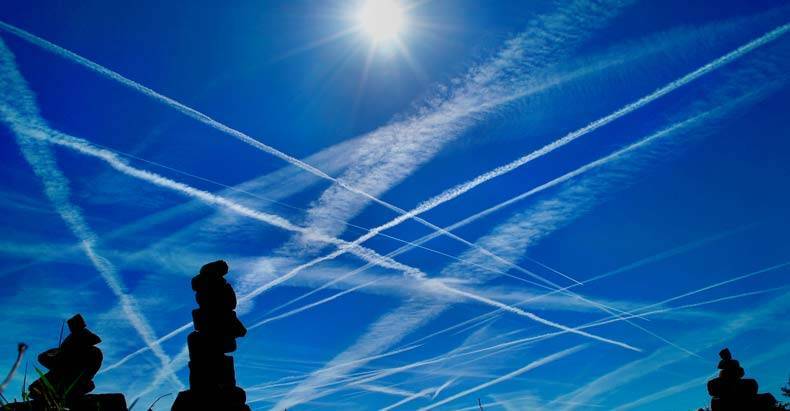 Some scientists have called for aerial spraying—or Solar Radiation Management (SRM)—to begin, but it seems that more have warned against this avenue, at least until much more research has been conducted. There are serious concerns that deliberate attempts to cool the climate with SRM could bring unwanted effects on weather patterns, and could even be used as a weapon by governments. While the scientific community debates these things, it appears that governments and other interests may have plowed ahead without waiting for the answers. A study published this month in the International Journal of Environmental Research and Public Health is suggesting that geoengineering has already begun, and the substance being used is a toxic by-product of coal burning call coal-fly ash. Why coal-fly ash? The answer could lie in the fact that coal companies have giant stockpiles of this waste product and have immense influence in the halls of government. Coal-fly ash consists of micron and sub-micron particles, ideal for aerosolized spraying, and it is effective at blocking sunlight. It’s one of four big waste products that coal companies are forced to deal with, instead of dumping into the atmosphere and waterways like they did for decades before. Coal-fly ash is the second-largest industrial waste stream in the U.S and is likely stockpiled in every state. They may have found a willing co-conspirator in national governments. The U.S. military is not new to weather modification. It conducted programs like Project Popeye (1967-1971) in Vietnam, which extended the monsoon season and flooded the enemy’s supply routes. The author calls for further studies to confirm this shocking find. Toxic coal-fly ash would pose significant dangers to the health of humans and the environment. It contains leachable toxins and has been described as more radioactive than nuclear waste. Arsenic and aluminum pose particularly big threats to human and environmental health. The health hazards of coal-fly ash are documented in this report from Physicians for Social Responsibility. Besides the toxicity of coal-fly ash, there is the overarching issue of climate engineering through aerosolized spraying. Scientists have warned that going through with this could bring profound changes to precipitation patterns, severely disrupting ecosystems and depriving human populations of drinking water. According to the author, coal-fly ash could exacerbate this situation.